I got to demo Campaign Trail at Gen Con 2015, and it was so much fun that I stuck around for an hour to play the game. And now it is finally on Kickstarter! Players act as the heads of the Republican, Democratic, and Independent parties. 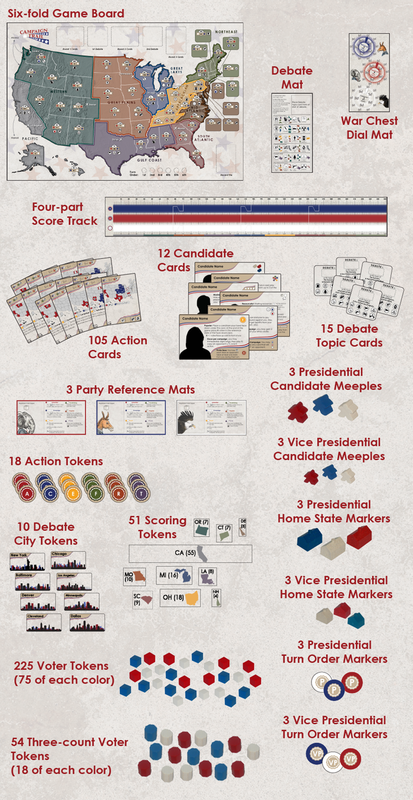 You use cards to complete actions like campaign, raise funds and advertise, all in an effort to win over constituents and grab electoral votes. Your team will make hot-button, important issues part of their platforms, but the game is designed so that you won’t have to take sides or engage in traditional debate, meaning the game won’t ruin friendships or family relationships. $54 – VOTER – Get the game! ONE copy of Campaign Trail shipped anywhere in the world. Shipping will be added to your pledge on checkout. $69 – SUPER PAC – Sponsor a card! Come up with your silliest SUPER PAC name and we will put a “Paid for by…” on one card in every game (for first printing only). Also includes the VOTER level. Shipping will be added to your pledge on checkout. $155 – CANDIDATE – Help Create a Character (Female)! You will be able to name one of the female candidates and provide a description and/or picture to help our artist create the image for the candidate card in the game. Also includes the VOTER level. Shipping will be added to your pledge on checkout. I highly recommend backing this game. The rules are simple and make sense, but the strategy can be very complex. If you have children, this game is a perfect teaching tool! Check out the Kickstarter here. You have until October 8th at 10PM CDT to get in on the game! We relaunched the campaign and are fully funded now. Only 5 hours left to pledge!